Serious chocolate lover? Well, get ready, sweet stuff. You’re gonna love this one. 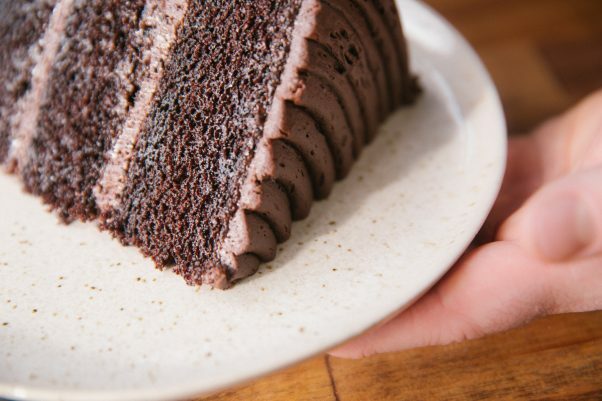 Our signature take on the classic chocolate cake is light and spongy yet devilishly decadent, and—thanks to dutch-process cocoa—dark as a moonless midnight. After months of trials, we found that our favorite cake used mostly old-school approaches—brushing the cake layers with simple syrup to retain moisture, for instance, just like professional bakers have been doing for decades. But this is a ChefSteps recipe, you know. There’s bound to be a twist. And that twist comes in the form of a magical little ingredient called glycerol monostearate, or GMS. Found in some of those fail-proof boxed cakes you loved as a kid, this easy-to-find powder keeps the fats suspended in the batter, leading to an impossibly moist crumb that’s never greasy. If you want to stick to the basics, however, skip the GMS. You’ll still wind up with a seriously tasty dessert with which to wow your dinner guests, spoil your children, and shame the other parents at the bake sale. We like ours with frosting, but you can swap in your favorite icing or ganache if you like. Just don’t forget to reserve a thick slice for yourself—we designed this one for serious chocolate lovers, after all. And if you’re ready to embark on this particular baking journey, we’re guessing your love of chocolate is serious indeed.